I am a firm believer that if you have a message and a mission, you also have a movement waiting to happen. Not all of us are ready to lead a movement though. A lot of us have quite a bit of self-talk to work through to even get to the point where we believe we have a valuable message to share. And some of us, like me, are waiting for someone else to give us permission to “own” the movement we've already created. 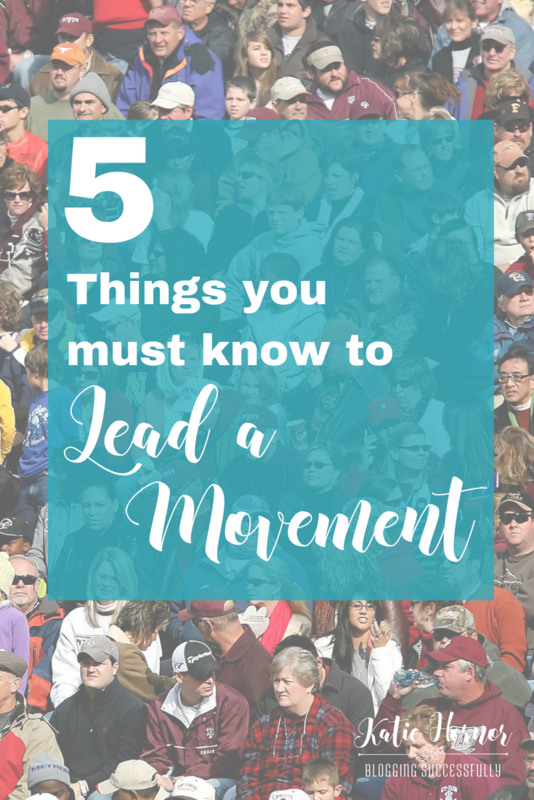 What I've learned in leading a movement is that there are 5 obstacles that will keep you from being the leader of a movement. When you conquer these, you’re on your way, but if any one of these is missing, it’s going to be hard to have a movement. When you're leading a movement, you're out in front. People are looking to you to tell them what to do. You've got to be a self-starter, a self-motivator, able to see what needs to be done and take action. Leading is hard work and and that work often involves having a willingness to learn new things, including willingness to invest in education, trainings, conferences and tools to learn what you need to know and to get the job done. A leader needs to be self-motivated even in learning. Some of your followers may eventually pass you up in knowledge and that awesome! But most of them will look to you to guide them with all the latest developments pertaining to your movement. I read 4 books each month (see a list of last year's here) attend multiple online trainings and at least one live event each quarter. And from those live events, I have made some of the most important business connections of my career. It's very difficult to lead when you don't know where you're going. Remember the Scripture that says “And if the blind lead the blind, both will fall into a pit” (Matthew 15:14)? You’ve got to have the power of a plan – one that can be tweaked as you go. Early in our business we had a 5-year plan to reach our full-time income goal. And after a very pivotal conversation (at a conference) with someone we looked up to in business, (maybe you know of Pat Flynn?) and we were able to tweak that plan to make it a 2-year plan, and we met our goal a lot faster. Every quarter, using our Blog Well Planner, we set aside a day to evaluate our short and long term goals, adjusting as necessary our expenses, promotions and activities to keep us on track. A plan is awesome, but almost as useless as no plan if you're not regularly evaluating what you're doing against the goals you've set and adjust the plan accordingly. As a leader, you must have courage and inner strength. You must believe in the necessity of your message, both because if you don't you won't get folks to follow and respond and because you will be challenged and attacked for your message. Often it's those crazy one-time comments on the blog that are fairly easy to slough-off, but sometimes the opposition will come by those who you considered your closest friends and confidants. Your belief in your message must be stronger than the opposition or you’ll never make it as the leader of a movement. We had folks tell us we couldn't start a business and do ministry at the same time. It was foolish, they said. We'd never make it. We had folks stop supporting our cause and cut off donations to our ministry because we started a business. Family members refused to loan us money when our business idea seemed nobler and more successful than others they'd loaned to in the past. It hurts. It doesn't always make sense, but if your belief in your message is strong, you will push through and build your movement anyway, and you will be stronger in the end. Not everyone has our same experience, but be assured that you will face opposition. Your success will depend on your ability to rise above it. As a leader of a movement, you will need both the guts and the humility to ask for advice and input from those more experienced. It's not easy to ask for help, especially the more you are seen as a leader. When you stop learning you stop leading, and even leaders need mentors and coaches who can speak life into them. There will be times when you will have to swallow your pride and admit that you don't know what to do in a certain area, and you'll need to seek help (and often pay for help) from those further ahead in the journey. The sick feeling in the pit of your stomach is par for the course. Do it anyway. I promise you you'll be better on the other side of that conversation. And then, you'll need the humility to put their advice into practice. Just as a plan is worthless unless you act on it. Advice is worthless unless you act it. When you start out to do something big, something that will change lives, you’ve got to surround yourself with folks who will believe in you and who will encourage you. You may have a message and a plan. You may be self-motivated and an action taker. You may even have the right combination of guts and humility. But if you don't have a support group of people to go to for encouragement when it gets tough to be a leader (because it will), or when you need help promoting your next life changing product or event, your movement will forever stay in mission mode. If you don't have a community like this, I'd encourage you to check out TheBlogConnection.com. This is where I regularly mentor up and coming movement makers, just like you, as they grow their message, multiply their impact with missional courses and build their movements. 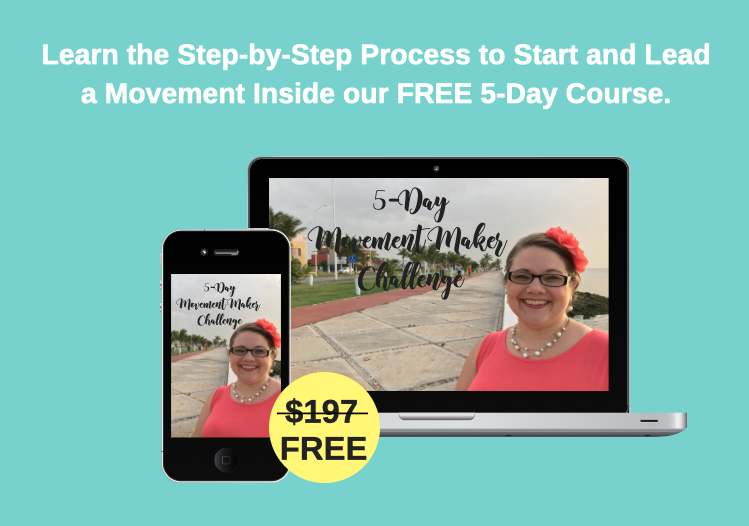 If you've got what it takes to lead a movement, join our 5-Day Movement Maker Challenge Now! Thank You Katie Hornor. I devoured this article. Every word touched and encouraged me to continue moving forward in my journey. I would not have gotten as far as I have today, with a huge tomorrow without blogging successfully and especially The Blog Connection, your mentorship and now your coaching. you’re very welcome Brenda!I am so inspired by all you’re doing in the Tiny House movement!